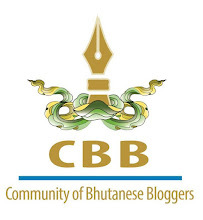 Recently we have started a Facebook group following our idea of building the Writers Association of Bhutan. Good responds we received inspired us to begin a blog. With this two we are in search of people who love writing, who can inspire us with their passion and who can lead us through our dream of having a formal association. The blog has just begun and we have five writers so far, we are looking for interested writers to come forward and be our part. It's a long dream and just daring is enough right now. I wanted to share my dream of WAB with my readers here, but I have it already posted on the WAB blog and therefore I urge you to go there once and see if you can help us. Well I am still waiting for my writers to break the ground but looks like they are all looking for something substantial to start with, probably they think this is not for their casual writings. But I must clarify that this is indeed the place for anything and everything you have on your mind. Until you decided what to write let me give my piece of mind about the association.